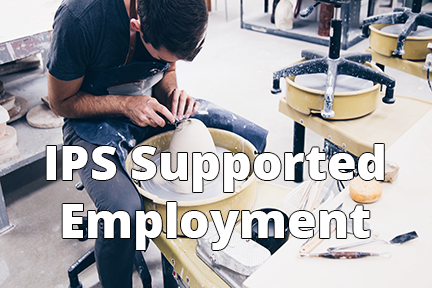 Individual Placement & Support (IPS) Supported Employment is an evidence-based approach to supported employment for individuals who have a serious mental illness. OCEACT recommends that ACT employment specialists use the IPS model and work as part of the agency’s IPS team. The Oregon Supported Employment Center for Excellence (OSECE) provides training and technical assistance in the IPS Supported Employment model to Oregon programs. 1. Eligibility is based upon client choice. No one is excluded because of prior work history, hospitalization history, substance use, symptoms, personal decisions about medications, personal appearance, missed appointments with mental health practitioners, or other factors. Every person is encouraged to think about employment and all interested people are referred to the IPS program. 2. IPS supported employment services are closely integrated with mental health treatment services. Employment specialists are assigned to one or two mental health teams from which they receive referrals. The employment specialists meet weekly with team members to think of strategies to help people with their employment and education goals. They have office space near or with the mental health treatment team and speak between meetings. 3. Competitive jobs are the goal. These are jobs that anyone can apply for regardless of disability status. IPS clients who are working earn the same wages as their co-workers (at least minimum wage) and are paid directly by their employers. The jobs do not have artificial time limits arranged by the vocational program. Jobs may be full or part time. 4. Employer contact begins rapidly after clients enter the program. There are no requirements for vocational testing, work samples, employment groups or other pre-vocational activities. Instead, the employment specialist and/or client have face-to-face contact with an employer within 30 days after the first IPS appointment. 5. Employment specialists build relationships with employers based upon client job interests. Employment specialists meet face-to-face with employers over time to learn about their business needs and the positions in their business. Each specialist makes at least six employer contacts each week with a person who has hiring responsibilities. 6. Job supports are continuous. Individualized job supports are provided until jobs are stable or until clients no longer want supports from the IPS team. Mental health practitioners (such as counselors or case managers) continue to help with job supports when clients are no longer receiving supports from the IPS team. 7. Consumer preferences are honored. Employment specialists and mental health practitioners provide help with work and school based upon client preferences for type of career, client strengths, preferences for supports, desires for specific work schedules, preferences about sharing disability information with employers, and so forth. 8. Benefits planning (work incentives planning) is offered to all clients who receive entitlements. Clients are offered personalized benefits planning before going back to work and when making decisions about changes in employment.